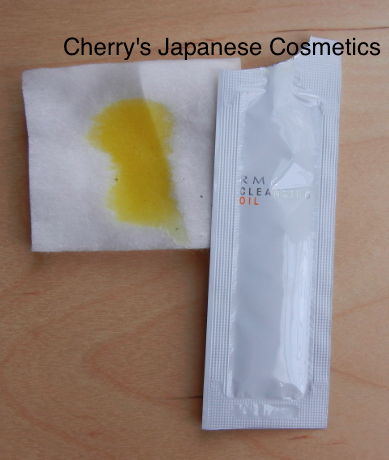 Last year, I (Cherry) tried this make-up remover from a kit. Sorry, there are no clear picture of this product. In this year, I got a sample of this product. Let me show you about it. This is yellow oil with mint smell. 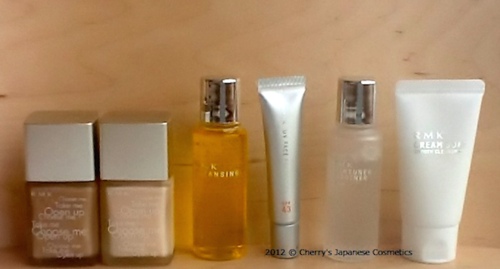 Order of the items which I use. Left; before I wipe by this oil. 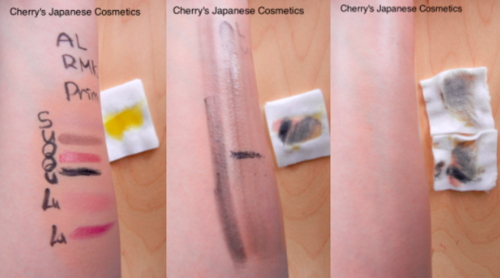 You can see how my arm is pretty clean with this product. In this time, I used cotton (to show you), but usually, I apply this product on my hands, and massage quite softly to rid of my makeup. Of course if you want, you can use this product with cotton like I did in this picture. Please do not forget to rinse well, and use your face wash after this product. It is true as I had used by myself, I can not use this remover with my wet hands. As a Japanese, it is inconvenient point. But it is also meaning I can make it emulsion very easily. The perfume of mint is somehow strong for me. It is a cleanser, I wash my face just after this product and the smell leaves easily. But I guess it is because of the perfume/ mint essential oil, and my sensitive skin, when I apply this product on my eye area, I feel small pain. yet totally to say, it works pretty good as a remover. I had done with my mini bottle for sunscreen remover for my body. Please check the latest price, and order from here; “RMK“. or order our JPY Branch!